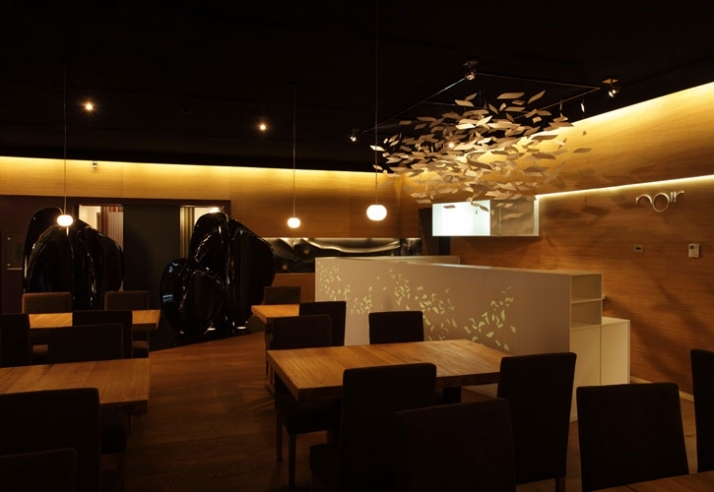 A warm, intimate interior greets you from the glass street scape as you enter Piatra Neamt's noir restaurant. Located in northeast Romania, Piatra Neamt is a city surrounded by mountains of forrest, which you will soon begin to understand how the landscape's beauty seeped into the interior space. The design team at Nuca, composed by Robert Marin, Ramona Macarie and Mirela Nitu utilized wood for it's warmth and relation to the surrounding topography. 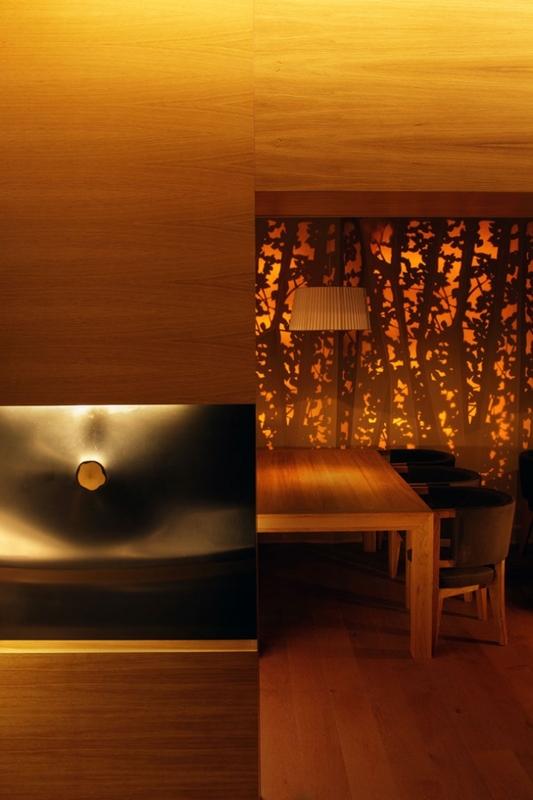 Rather than just wood tables, wood flooring and wood wall panels, the palette is broken and accentuated through sculpture, lighting and contrasting textures. The walls are cladded with a sculpture that sits right along the horizon line of our seated view, acting as a barrier, wrapping us intimately in this interior space like the mountains wrap around the city of Piatra Neamt. The artist shaped the sub material (wood) and finished it in black corian only to enhance the texture and form of the work. We know that the objects were sculpted out of wood because the artist amputates the material at precise locations to reveal the material that shapes it; this dichotomy creates a discourse of public and intimate, of natural and man-made. 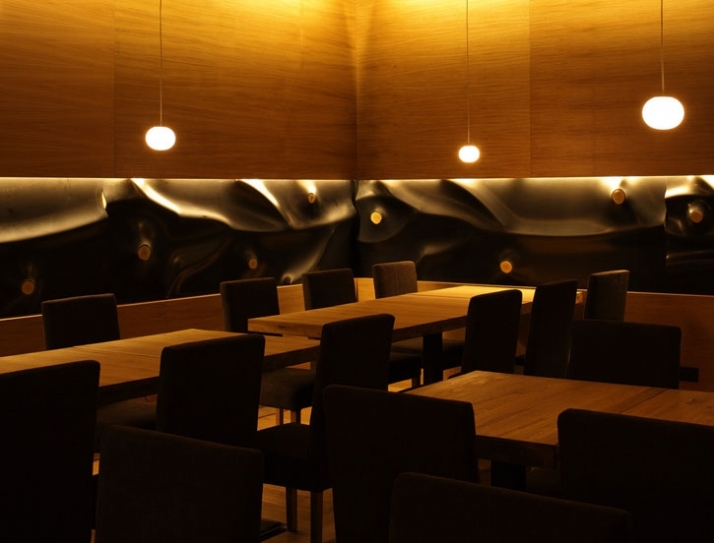 The wood piercing and the dark veins shaped in this black dune reminds us of the power nature possesses as it embraces the main dining space; it reminds the visitors that they are never too far from nature and Romania's mountains. It creates quite a dichotomy of materiality; soft, natural wood fighting through a shiny black exterior coating. The piece is compelling and helps blur the line between nature and unnatural ornamentation. The ceiling height opens up the interior and allows for large panels of wood to ornament the surrounding walls. 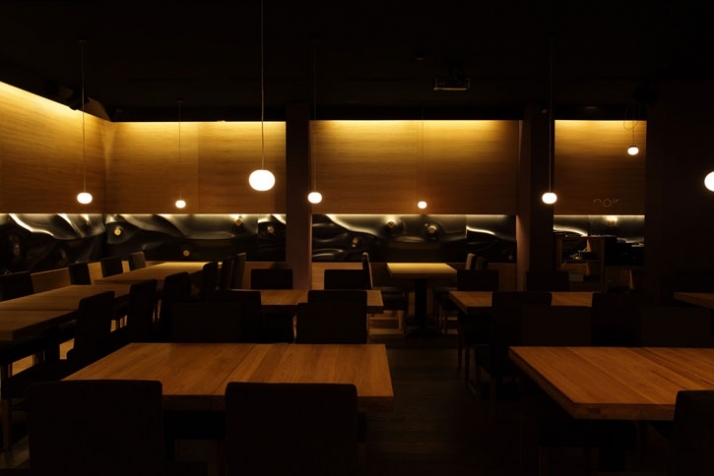 There is only a touch of decorative lighting dropped from the ceiling above bringing light to the tables, the remainder of the space is glowing through cove and ambient light. A cluster of mobiles float through the interior space almost like a flock of birds. The adjacent pendant light highlights these simple suspended mobiles as they create movement and shadow on the surrounding surfaces and walls. 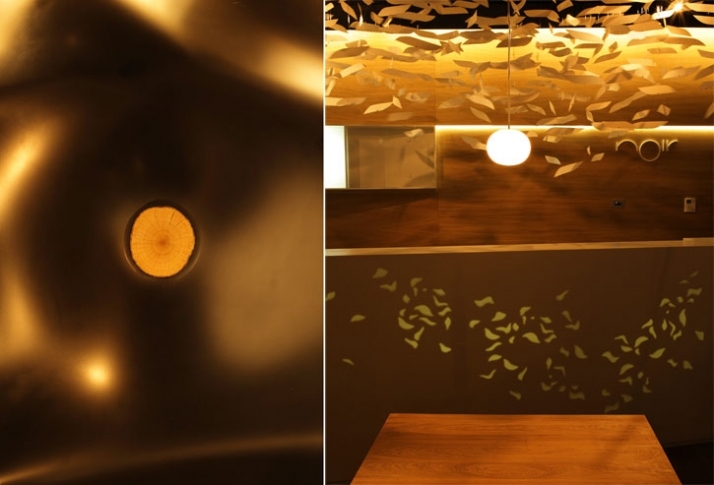 The textural qualities of the forrest are also brought into the dining experience in a more literal way as the wall graphic contains images emulating trees full of leaves. The seating is simple, yet in the same language as to not distract from the landscape established in the surrounding architecture of the interior. 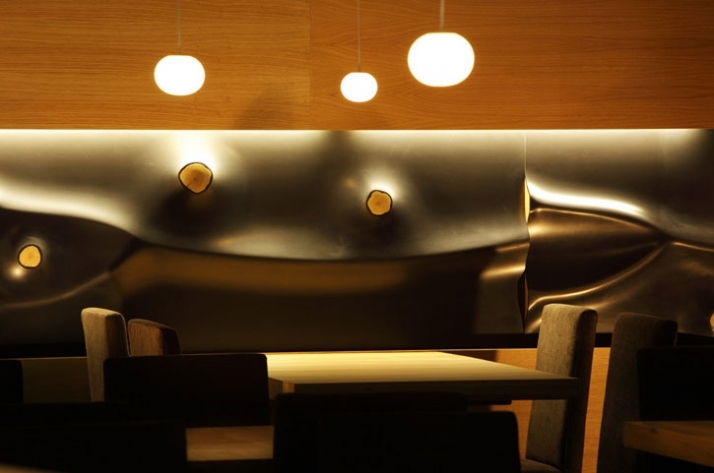 The fluid form represented in the vases by Zaha Hadid sit just outside the washrooms and continue to develop the natural, inviting personality of the restaurant. They are black in color, which starts to fade into the rest of the space, but because they have a high sheen, it's just enough to make them pop with accent. You would think the restrooms would continue the language of the restaurant thus far, however you will be pleasantly surprised to see the stark contrast these facilities offer. 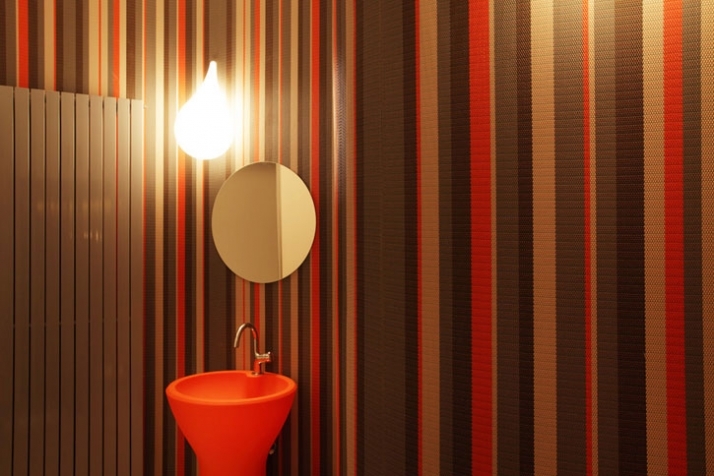 A flooring of bold, vivid stripes has been applied to the walls as it texturizes and adds energy to the room. Although the walls create strong curves in the room, the wall pattern remains linear and geometric. Matching vanities sit tucked back into the curved wall sized just for their function. The lighting is again simple in form as to not distract from the movement and excitement of the surrounding surfaces. 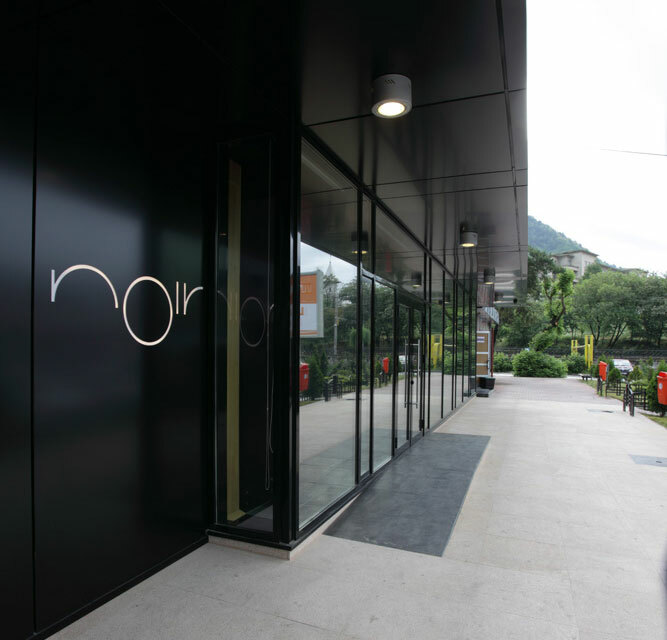 So whether you want to stop for dinner or check out the dynamic interiors of the space, the noir restaurant is nature within a box placed within the beauty of the surrounding environment.